I’m in a WoW funk. 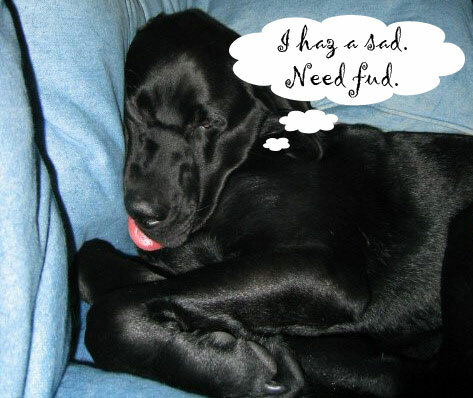 Oh come on, that’s just an excuse to post goofy pictures of your dog. No, really. I’m not sure what it says about me that I have WoW mini depressions but I do. I am disappointed at the least. I’ve given up, thrown in the towel. After four years of hopefulness about finding a guild I have just finally put all my characters in my bank guild. I admit that hoping to find a guild of older players with a heavy concentration of them online between 6:00 am and 3:00 pm is asking a bit much. I think the problem is that the first guild I joined way back in vanilla was such a guild. My server was fresh and new and a group of experienced people rerolled there and started a guild. Some of them were EMTs and nurses and worked strange hours so there was always someone to talk to. I remember discussing the merits of different fast food breakfasts while I was stuck in Desolace with nothing to eat but Delicious Cave Mold. Ah, the good old days. It only lasted a couple months though. 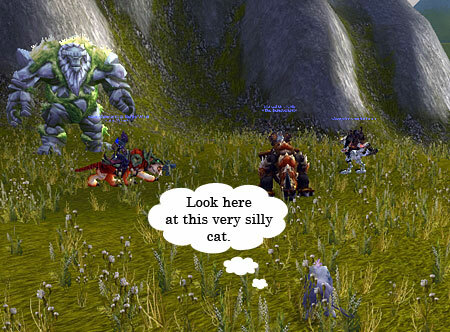 We finally had enough members to try our first instance, which was Scarlet Monastery … we were awful. The poor GM and an officer were trying to get us newbs into shape but OMG we were really bad. I didn’t have a clear idea at the time of what a dungeon really entailed so I did the stupid hunter trick of running out of arrows, and as the hunter dead zone was still there at the time I also pulled more NPCs into the fray by backing up to get range. There was more horror but you get the idea. After the instance debacle I finally had enough money to buy my guild tabard, I put it on and admired it and logged for the night. When I logged in the next day I had a blank tabard. Huh, what happened. I then finally sussed that I was no longer in a guild. The shame, I mean I knew I had been awful last night but hey we all were. I’ve been kicked!!! No not really. I found another guildie and whispered her. She said check out the guild website. There was a very nice notice that the GM had disbanded the guild overnight as he had real life commitments and none of the officers wanted to take over. I checked and neither the GM or officers still had characters on the server anymore so I think that translates as “we thought it would be fun to start a guild on a new server but had no idea what trying to teach a bunch of newbs to play would be like” lol. I can’t really blame them, it couldn’t have been much fun, we were that bad. Some of the guild decided to reroll horde, some went to other guilds, other servers and other games, finally there was just me left. 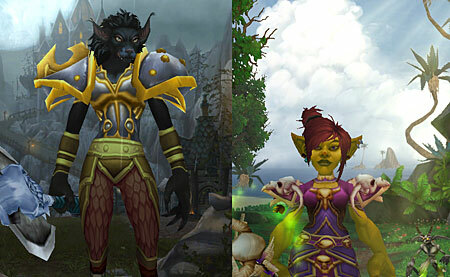 After that between my different characters I’ve probably been in five or so other guilds. But although when recruiting, guilds always say, it’s okay if you’re only on in the daytime, it’s okay that you won’t be raiding they really don’t feel that way once the time comes to try to fill a raid. So instead of being in a funk I guess I should be happy, I’m going to have a completely dramaless guild and who knows in a year or two my guild might make it to level 2! I can’t seem to get any focus right now in Cataclysm. I run from one thing to another. Oh, I want to survey … no wait I want to just take a peek at Uldum. I really should farm some leather to level leathercrafting, sheesh I’m all over the place. So although this has nothing to do with our new shiny world it is seasonal. It’s holiday time, the time when your friends and family want to know what you’d like. They say make a list, tell me what you’d like. 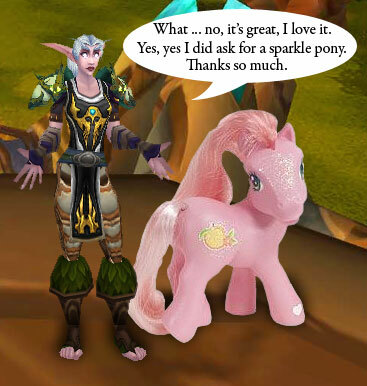 So I drop hints, when my husband complains that I haven’t given him any ideas I point out that the Blizzard Store has vanity pets and a mount and the ease of shopping digitally. He’s got to like that, right? No malls, no driving, this is just his thing. And his response? He laughs, like I’m kidding or something. I simply cannot get any of my real life people to believe that a digital gift is … well … a gift. I remember when WotLK was brand new and the Darkmoon Card: Greatness was the thing to have. My son-in-law was playing a rogue on another server at the time and really wanted one but they were still too pricey. I thought, great, I know what I’ll do, it’ll be the perfect birthday gift! My scribe got busy making cards as fast as she could. I finally was coming close to completing but I think I had to buy two cards as time was running out. I made a level 1 to transfer to his server and found out a character had to be at least level 10 to transfer. I sent her out to bonk everything is sight and finally leveled her enough to transfer to his server. Yay! I was so proud of my unique present idea! My husband was scandalized, he kept saying fine but what’s his real gift. Sigh … I guess the important thing is that my son-in-law thought it was the best thing ever. So I’m pretty sure I won’t be getting the Celestial Steed for Christmas! Now that I have a few days under my belt in Cataclysm the first thing that stands out for me is I seem to be leveling extremely fast. I feel like I have a full set of heirlooms on my druid which I don’t. I had read about professions giving XP and of course forgot about it in all the excitement so my plan to slow down by doing some archaeology didn’t work so well, lol, I dinged 81 in Tanaris digging up fossils. Got to get my Fossilized Hatchling completed. I am happy about archaeology, not because the mechanics are fun it’s about as much fun as fishing, yeah, that fun. I am happy as it finally gives me an excuse to visit places I remember fondly but outside of getting Loremaster there was no reason to go back to. I had really hoped that Blizzard would come up with something so that I could revisit my favorite places like Winterspring and Tanaris and they have. I have always favored Darnassus and Ironforge so I was dreading having to hang around Stormwind but hello, we have color-coded roofs! 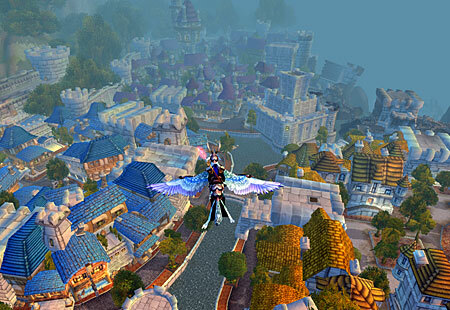 Now that I can fly over Stormwind I’m finally finding my way around by the rooftops, this is great, I now don’t have to wonder aimlessly about SW while the guards eye me suspiciously. I now realize that as soon as Cataclysm launched I was able to get over my obsession with being fried by Deathwing. It seems the look I got at him flying into Mount Hyjal satisfied my burning (ha) desire to see him. And boy, did I ever forget how crowded zones are at the start of a new expansion. I thought I’d give Hyjal a day to thin out so went through the Worgen starting zone. The experience there was a complete 180 from my first character’s experience back in vanilla. My hunter really leveled through vanilla for the most part by grinding because I couldn’t ever find the quest hubs or for that matter the quest items. Okay some of it was caused by my inexperience and the lack of the resources there are today but Darkshore was, well, painful. Gilneas on the other hand was not. I almost got whiplash as I was ushered along my quest lines. I’m sure I didn’t miss any quests, it was pretty linear. For the most part I was happy with this it sure beat stumbling around Darkshore but I think it was a little cruel to litter the area with mining nodes when there was no way to learn professions or were those trainers hiding somewhere and I just didn’t find them? Overall I’m thrilled with my new alternate universe, my home away from home, or um my home while I’m at home, oh whatever, you know what I mean. Oh and one last thing. I am ecstatic about going to the AH and seeing something DIFFERENT, geez, I don’t even care if I can’t use it I was so tired of knowing everything listed at the auction house by heart. Yup, those are my new girls all decked out in their heirlooms, but more about them later. The first thing I did once I got Cataclysm loaded was to get on my druid and head for Mount Hyjal. What a shock, although I knew it was coming. One little NPC and it took me what seemed to be forever of waling away at him to get him down. And they were right, pulling a group like you did in WotLK? Not such a good idea now, lol, you can die again! It was refreshing, kind of gave meaning to the fight. I noticed that I was more than halfway to 81 and I want to make this expansion last so I decided to give her a rest. I had been really excited about Goblins for the most part based on the great movie below. So I made a Goblin Warlock, kind of cheating as I already play one but as she’ll be my only Horde character on this server she needed an edge, no one to send her gold poor girl. So what did I think of the Goblin starting area? Beats me. Almost immediately I got the quest Rolling with my Homies where you get keys to a Hot Rod and that was the end of my leveling. 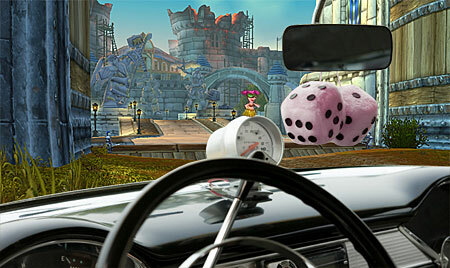 I spent the rest of the evening zipping around Kezan flooring my Hot Rod with the radio blaring. Hopefully tonight I can be a little more focused and not distracted by my Hot Rod. I wasn’t as excited about the Worgen but I wanted to do at least the starting zone so I made a gulp, warrior. This is my first warrior, I’ll have to spec Arms or Fury as I don’t want to spec Prot and have anyone think I might know what I’m doing. I tried to make her look as intimidating as possible in the hope that NPCs would run away in fear at the sight of her hopefully dropping their loot so that I wouldn’t have to stand there trying to figure out how rage works while they kill me. I’m hopeful though, I managed to get her to level 7 without my contacts in so I’d say that bodes well. I am trying very hard to be responsible, I keep telling myself I still have presents to buy for the holidays, I have a great many bills coming soon for the gifts I’ve already bought. Do NOT buy the digital download, DO NOT click that button. You have ordered a copy and in a short (OMG) four hours you can get in your car and go pick it up. FOUR HOURS!!! And then I have to drive there, and then I have to drive home again. It’s not like I have any lofty ambitions, I’m not going to be in a hurry to actually do anything once I login, just wait for all that’s holy, geez, get a grip, sigh. So while I wait, what did you do in the waning days and hours of WotLK? Something productive? Make money to buy Flight Master’s License’s for all your characters? I’m afraid I did what I promised myself I wouldn’t get caught up in. I wasted all my time standing around in the middle of nowhere hoping a certain Deathwing would come by and fry me. I can’t really say I camped him, it was more like obsessively checking. I parked my druid at the fabled Arathi (44,66) location and kept logging in and checking to see if everyone was still there, and they were … still there. I know better than this, it took me from level 76 to well into 80 to finally tame Loque’nahak and I actually knew what zone Loque’nahak would spawn in, not like the gazillion different places Deathwing might show up. And it’s not like I didn’t get hints that this was not going to work. One of my fellow Arathi standees who had been seriously camping the spot logged in and whispered that she finally got Stood in the Fire. I said grats, when did he show up? The answer was that she finally gave up and went to Wetlands to quest and was killed by him there. That should have been a sign, give up, go about your business you silly cat. Hmmm, I have like four hours before I pick up Cataclysm, maybe I should hang around Arathi. Oh Deathwing, I wish I knew how to quit you. 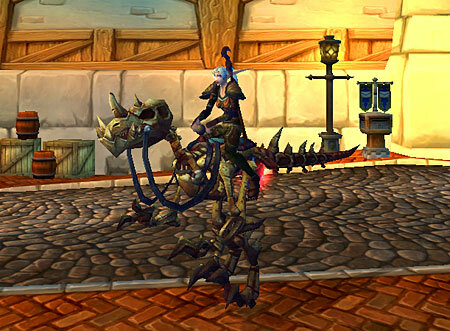 Much like the Boots of Canine Restraint my WoW routine kind of snuck up on me. I wasn’t aware that I had one until quite recently. It has taken years to evolve but the other day I realized I do indeed have a routine. What do I do? It seems that before I login every day I first check WoW Insider to see if anything is up that I should know about, like the elemental invasion has begun or the bottom has dropped out of gem sales. I then check MMO Champion to see if there are new images or interesting Blue posts. I then check my favorite blogs and lastly I make sure I visit Save a Dog on Facebook, I’m not sure how that one snuck in my WoW pre-game warm-up but it’s there. I always login to my bank alt first, even if I didn’t have anything for sale I’m always hopeful. I remember a while after WotLK launched I got an email from the auction house with 300 gold that I hadn’t even noticed missing because of a glitch, so hey, it could happen. After that my alchemist transmutes a gem, my jeweler cuts it and it’s up for auction.